This grill offers a true 24" across the cooking surface, not the FRAME of the grill like others measure. The total cooking area is approximately 432 sq. inches. Includes a stainless steel cart with heavy duty casters, two doors, side shelves and lots of storage space. The grill also has two side shelves for lots of prep space and a high dome lid to accomodate larger pieces of meat. Front loading door makes it easy to add more charcoal while the unit is in operation. That means you don't have to remove the cooking grids and the meat to add more fuel to the fire! Every Firemagic Charcoal Barbecue includes easy temperature control by turning the front-mounted crank to literally raise and lower the fire. Firemagic Charcoal Grills also feature heavy-duty specially-textured cooking grids that are made of thick 5/16" rod. These grids will last a lifetime and are perfect for cooking many types of food. The textured finish also helps food resist sticking to them. These charcoal units allow you to match them to Firemagic gas unit accessories for your complete outdoor kitchen or cooking package. 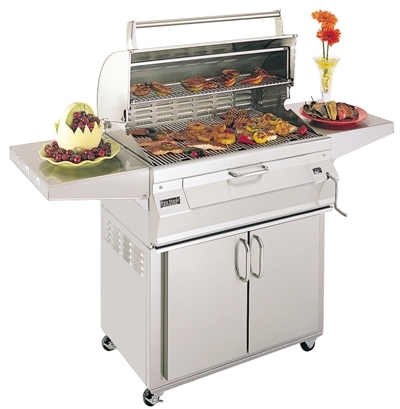 All offered by a company that has been building outdoor barbecues for almost 50 years! You know they will be here tomorrow. © 2019 COMPANY, All Rights Reserved.